How do we fare when called upon to face unpleasant truths? How do we manage that call to take on a difficult task that seems to have no end? How do we rate on the empathy scale? This is the essence of what Moses is facing at the theophany at the burning bush in this week’s Torah portion. Malbim takes the analysis of Moses hiding his face a bit further. By hiding his face, Moses shows he is not ready for a complete relationship with God. Malbim says that the Hebrew verb meihabit is not seeing so much as giving full concentration on something. Hiding his face is really Moses retreating into the material world, not able to spiritually and intellectually comprehend God. The material world is kind of his safety net. He hears God’s commands. On some levels he understands what is being demanded of him. But he is not ready for what eventually will be “knowing God panim el panim (face to face).” It is very important to note the intellectual component of the human/God relationship implied by Malbim. Meeting God “face to face” is intellectually as well as spiritually demanding. Did Moses act properly by hiding his face? Sages who argue he did not say God would have shown him what was above and what was below – the secrets of existence (see Exodus Rabbah). Malbim’s commentary seems to agree with this by adding Moses was not ready for ultimate truth. Ba’al Haturim, however, takes a slightly different tack. He says that had Moses looked into God’s presence at the bush and asked for relief of the Israelites’ suffering, the exile would have been ended right then. Israel would have been freed. Thus we can ask, what is it Ba’al Haturim thinks Moses would have seen had he not hidden his face, that is, if he had tried to look at God face to face? The writer (George Packer) identifies some important questions. First, how much are these murders based in the tenets of Islam? It is silly to deny that the Muslim world is going through a very dangerous time of increased radicalism, resulting in violent acts. It is also silly to deny that too many Muslims have some degree of sympathy with the motives behind these attacks, along with the violence perpetrated by ISIS and by organizations such as Hamas against Israel. All religious groups have abhorrent members. For Jews, an example is Baruch Goldstein, who massacred Muslims during prayer in 1994. How do Jews react to violence like Goldstein’s by other Jews? Even most Jews who take a hardline view of Israel/Palestinian issues condemned Goldstein’s violence. The Jewish community is so small (13 million worldwide) that we are sensitive to the repercussions of Jewish violence. Every military action by Israel spawns intense debate in the Jewish world over its appropriateness. The sheer size of the Muslim world (1.5 billion) creates the probability of more violent perpetrators as well as sympathizers. Unfortunately these voices get the dominant attention. Yet, it would be a grave mistake to characterize all of Islam by the murders in Paris. Many, many Muslims feel revulsion over murders done in the name of Islam. Their sympathies are completely with the families of the victims. So the truth about the Muslim world is complex and hard for people to grasp, because it requires holding seemingly conflicting ideas at the same time. It is true that Islam is experiencing troubling convulsions. The existence of Muslim groups obsessed with violence is a reality. Muslim anti-Semitism is also very real. These are the same kinds of convulsions experienced at points in Christian history – say during the Crusades, the times of the Inquisition, or when some Christians gave religious justifications for the existence of the KKK. It seems to be Islam’s turn in history to wrestle with with excessively violent trends and radicalism. At the same time we have to realize that hundreds of millions of Muslims want nothing to do with these violent movements. They DO speak out, but often the media ignores th0se voices who do not fit the preferred narrative of the moment. I, for one, admire my Muslim friends who are speaking out, and I sympathize with their frustration over what they see as a hijacking of their religion for nefarious purposes. A second problem is in understanding what is at stake by attacks on journalists. It is completely wrong to blame the victim by saying Charlie Hebdo was stupid for printing offensive materials. The attack on Charlie Hebdo is an attack on freedom of expression. The inability of any religious group to accept satire or criticism shows a lack of maturity by that group – witness the annual nonsense about the “war on Christmas” by some Christian groups in the United States. Perpetrating murder in response to satire, however, is beyond immaturity. It is inhumane and criminal. 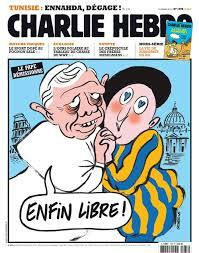 Whatever one might think of Charlie Hebdo, all of us are victims of the crime because it is an attack on the basic principle of freedom of expression. God’s call to Moses at the bush is not about forcing a religious ideology upon the Egyptians. It is not about violent coercion of any kind. It is a call to lead a group of people to freedom, to alleviate suffering. When we hear the pain and suffering of others, we are starting to perceive God’s voice. If we look at the truth of how humans act – the good and the bad – we have taken a step on the path to know God. Ultimately there can be no hiding of our faces. If we look into the vision God provides, if we really understand what we are being shown, then, when we dare to look at God face to face – we will find our own face staring back at us.